From a humble beginning in the year 2009, WhatsApp took the world by storm with an instant messaging application for smartphones, namely Windows, iPhones and Android phones. Ever since its inception, the company has seen unparalleled and exponential growth in its user base. The number of people hooked to it as on date is more than 700 million, an astounding figure that makes WhatsApp the undisputed king of instant messaging applications worldwide. Now users can Get Unlimited Global Access and Connect to WhatsApp Without Wi-Fi and 4G, 3G, 2G GPRS Mobile Data Plan Using ChatSim Card. The reason for this immense popularity lies in the business model of WhatsApp which not only helps people always stay connected with their near and dear ones by real time chatting but also offers fancy new features that have become an inseparable part of their lives. From photo and video sharing with a click of a button to checking when a person popped online, everything works seamlessly and more importantly, without those unwanted ads. The huge popularity of WhatsApp has not gone unnoticed too, with the social media giant Facebook paying a jaw dropping 19 billion dollars to acquire the company which clearly threatened to jeopardise its position. WhatsApp relies on carrier data or Wi-Fi connectivity to send across text and multimedia messages. This may come across as hurdle for some people, especially the travellers who frequently cross national and international boundaries. Since Wi-Fi connectivity is not available everywhere and data charges skyrocket on while roaming, people are sometimes forced to stop using the application that they love. An Italian company has launched a remarkable solution to conquer this situation. 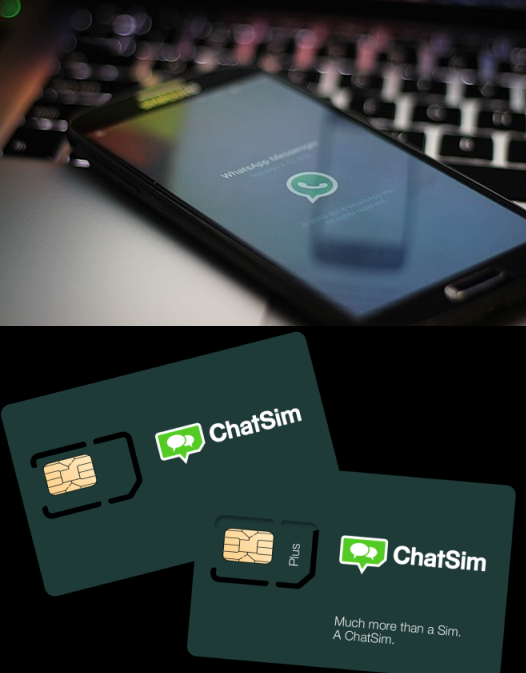 They have come up with a SIM card named “ChatSIM” (Formerly known as “WhatSim”), that’s dedicated to WhatsApp, QQ, Facebook Messenger, WeChat, Skype, Viber, Line, KakaoTalk, Telegram, Snapchat, Twitter, Google Hangouts and Apple iMessage messaging applications. It comes with a plan that lets users enjoy WhatsApp for free while travelling across 150 countries. Zeromobile, the company behind this intuitive idea has done tie-ups with around 400 carrier networks worldwide to accomplish this feat. The SIM gets connected with the best network available anywhere in the world and gives the users complete peace of mind by offering uninterrupted connectivity anywhere they go. The users can get the ChatSIM for €10 EUR and enjoy unlimited WhatsApp messaging for a year. The SIM card offers free text messages, location updates and contacts; however, users will have to buy credits for sharing photos, videos, and voice messages. The company is offering 1000 credits for 5 EUR with easy recharge options from their website and from a dedicated application that will be launched shortly. As of now the company is focusing its services in Europe, along with parts of Africa, the Middle East and South America. The ChatSIM comes across as a very tempting option for people who are avid travellers and like to keep in touch with their friends and family through WhatsApp. The goal of Zeromobile is to reduce the mobile bills whenever possible and the company has taken an initiative that promises to do just that. ChatSIM has the potential to take the popularity of the already highly successful instant messenger to a whole new level by offering freedom that users are going to love. The WhatsApp SIM works with Windows, Andoird & iOS Smartphones and Tablets.